Budsarakam Tour is a bus operator based in Thailand that was established in the year 1993. The successful company began their bus service operations by offering their first route that goes from Bangkok – Udon Thani – Si Chiang Mai in 1993. The company has gone on to provide plenty of bus route options that you can book the bus tickets easily through Easybook in order for you to travel to more places. The main office for Budsarakam Tour is located at Ratchadapisek Road in the city of Bangkok. To provide convenience to customers, the company has established two branches in Rangsit and Bangkok Bus Terminal (Chaktuchak) as well. Rangsit is a metropolitan city that supports the expansion of Bangkok in the north located at Pathum Thani Province. As for Bangkok Bus Terminal (Chatuchak), it is a bus station also known as Mo Chit Bus Terminal or Northern Bangkok Bus Terminal and it is the biggest bus station in Bangkok situated in north of the city on Kamphaeng Phet 2 Road. Most of the Budsarakam Tour buses come in double deckers. There are 3 types of double decker buses owned by the company and they are equipped with 32, 35 and 37 seaters respectively. Air-conditioners and comfortable seats are installed in their bus coaches to create a cooling and relaxing ambience for their passengers to relax during the trip away from the warm weather of Thailand. Passengers will definitely be able to take a quick nap or catch up with their favourite movies saved in their electronic devices while enjoying the comfortable facilities provided onboard throughout the journey wherever they may be going. Budsarakam Tour aims to provide bus services with high quality in order to ensure the company moves forward to accomplish their vision of becoming a leader in the bus travel industry. The bus company never neglected their responsibility on improving their services to assure satisfaction of their customers. 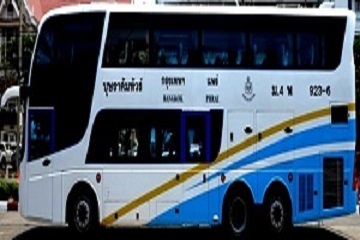 The company is currently providing bus routes from Bangkok to Phrae, Ubon Ratchathani, Nong Bua Lam Phu, Udon Thani, Nan and Nong Khai with return routes too. Besides that, one-way trips from Bangkok to Yasothorn and Amnat Charoen are also offered by the company. You can make Budsarakam one of your top choices when you decide to travel within Thailand as the company is providing the options of many bus trips to different destinations in the country. You have the option to buy Budsarakam Tour bus ticket online at your fingertips through Easybook whether you are on your laptop, smartphone or tablet now! Book a Budsarakam bus ticket and start your Thailand adventure now! 999 buildings Bus Terminal on Kamphaeng Phet 2 Road, Chatuchak, Bangkok 10900.